As I travel around the southeast coast of Florida I am struck by the many different trees found near the beach. I seem to find myself looking through these trees to the sandy beaches. 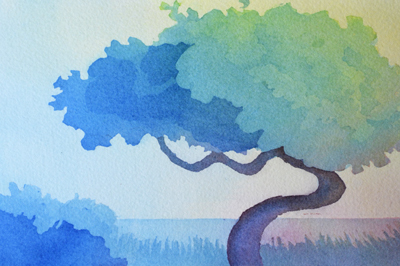 This small Florida landscape painting is 5″ x 7″ and is of a curvy shaped tree with winding branches. I painted this watercolor with basically 3 colors: blue, rose and yellow. Watercolor painting using only three tube colors layered on top of each other can produce many more colors and values to make an interesting painting. I start with the yellow and then add rose and then the blue working from one side toward the other side of the paper. After this dries I continue with the next layer, I keep adding more transparent layers of watercolor paint until I am finished with the painting. The three tube colors I used for this painting are Hansa Yellow, Red Rose Deep and Pthalo Blue. Most watercolor paint brands have these three colors available and they can be purchased online or from an art supply store. Check back to see my next Florida painting as I travel the seaside towns of southeastern Florida. I’m sure this next painting will include the beautiful palm tree. If anyone can tell me what kind of tree is in this painting I would appreciate hearing from you.